What do Felix Neureuther, Lindsey Vonn and Michaela Kirchgasser have in common? Of course, they are all very successful skiers and winter sports enthusiasts. In addition, when it comes to selecting ski poles, they put their trust in the long-established German manufacturer LEKI Lenhart GmbH with its familiar LEKI brand. LEKI, which is located in Kirchheim unter Teck, near Stuttgart, was founded in 1948 and is a real German success story. Its founder, Karl Lenhart, had a background in the wood products industry and early on began experimenting with new materials, introducing the first mass produced fibreglass composite ski poles in 1960. The company continued to expand its know-how through the decades, so that today LEKI is one of the top brands in the international skiing and trekking business. Over 250 patents registered in the field of outdoor and alpine sports products attest to LEKI’s innovativeness. Today the company has over 250 employees worldwide. Like many manufacturers of brand-name products, LEKI was put in a real bind by the boom in e-commerce: Either jump into the online business and dump local dealers – partners who for decades made the brand what it was – or do nothing and hope that “this Internet thing” was just a flash in the pan, thus sacrificing the additional sales and market reach offered by the global digital showcase. But LEKI had never made compromises in product manufacturing and was not ready to make a poor compromise now. Then LEKI learned about gaxsys GmbH, whose solution to the moral dilemma made total sense: integrate dealers into LEKI’s online added-value chain. The gax system allows manufacturers and dealers to stand shoulder to shoulder in the digital world. With the gax-System, LEKI now has a sophisticated order management system that allows it to pass orders received in the LEKI webshop on to its authorized dealers. Orders from consumers are forwarded to a virtual product exchange that is accessible to participating local retailers. If a dealer has the ordered product in stock, it issues a binding confirmation that it will take over the order and then dispatches the product. Location data is used to ensure that the order fulfilment is offered first to dealers in the immediate vicinity of the customer. In this way, the shipping routes are short, and customers can contact the local dealer directly if they have questions about the product. At the same time, the number of orders received by the participating dealer increases significantly. If a nearby dealer who can deliver the product is not found within a specified time, the radius of the exchange is gradually increased. If no dealer responds, the order goes to the LEKI distribution centre, thus guaranteeing that no order is left unfulfilled. It’s not only the consumer and the local dealers who benefit from omni-channel commerce: By utilizing the floor spaces of the brick-and-mortar stores as decentralized storage locations, LEKI needs to keep less stock on hand for e-commerce, while the range of the products that it can supply online increases. A product is supplied from a physical store, the retailer handles returned items. “By linking our new online shop to the gax-System, we have achieved scalable and sustainable point-of-sale integration. 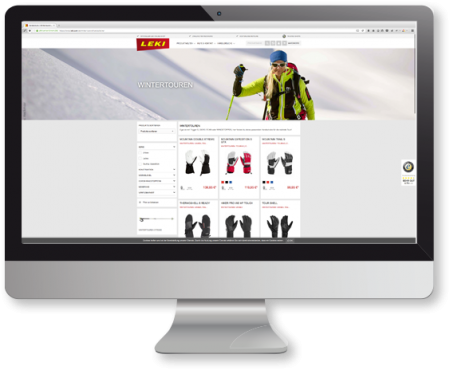 In addition, by integrating our online shop and brick-and-mortar dealers, we are investing in a forward-looking collaborative e-commerce system,” notes Markus Milbrandt, Director of Marketing at LEKI Lenhart GmbH. Initially, only independent dealers were included in the system but now groups of associated companies, such as the Intersport group, are coming onboard. The gax-System originated in Germany but now is also in use in Austria and Italy.